I received this ebook from NetGalley and Little Brown in exchange for an honest review. 16-year-old Scarlett has lost both her parents but that hasn’t stopped her from wanting to clean-up crime in her hometown. When a little girl named Gemma begs her to find out why her older brother has been acting so strangely, her investigation leads her to a conspiracy involving cults, curses, and Jinn. When she discovers that her family has ties to this supernatural world, she realizes she may finally be able to solve her father’s murder. There are so many things I loved about this book starting with Scarlett. This is the first YA book I’ve read featuring a Muslim American and I thought the author did a great job detailing the Islamic religion without having it take over the story. With her father murdered, and mother having died from cancer, she and her older sister Reem are left on their own. Intertwined with the current story are Scarlett’s childhood memories which are truly touching. My favorites are the ones describing Scarlett and her father reading One Thousand and One Nights together. These memories are so precious, she still keeps the book close to her. 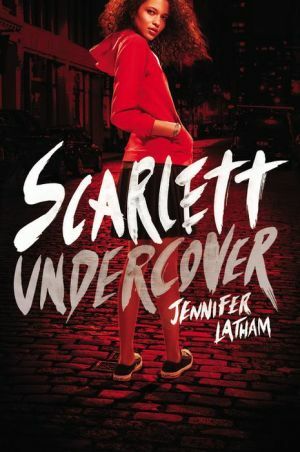 While Reem finds solace in Islam and working long hours at an inner city hospital, Scarlett graduates high school two years early and since she’s had little luck solving her father’s murder, she takes on cases with the help of a sympathetic police detective that which she has much more success with. She may be an orphan, but with her sassy, take-no-prisoners attitude, Scarlett never gives you time to feel sorry for her. She carries a blackjack for protection, and is proficient in martial arts, yet despite her tough exterior, she has a soft spot for vulnerable children and dogs. When cute, goggle wearing 9-year-old Gemma first approaches Scarlett with her concerns about her brother Oliver, Scarlett’s first reaction is to politely rebuff her. But then she discovers that Oliver has ties to another boy who committed suicide. As she starts investigating, she finds out that Quinn’s suicide isn’t as cut and dry as it seems, and suddenly she has her hands full with murderous Jinn worshipping cultists. Adding to the intrigue is that her biggest lead is a mysterious family relic, which she and her sister haven’t paid much attention to up until now. Scarlett and Reem are very close despite Scarlett having drifted away from Islam, while Reem has begun wearing a hijab. It’s obvious that they both have a deep respect for one another. Scarlett has persuaded her sister to let her put off college for a few years while she pursues her passion for solving mysteries. While Reem sees how being a PI has saved Scarlett from getting into far worse trouble on the streets, she insists they attend Friday prayers with together, but Scarlett in no way resents her. Indeed, it’s their shared Muslim heritage that helps keep them close. The secondary characters add even more layers to this wonderful story. Her mother’s best friend Delilah, a Jewish white woman, helps keep an eye on her, and her son Decker moves from best friend status to potential love interest quite sweetly. Detective Morales who investigated their father’s murder stays involved in their lives, as does Mook, who is Scarlett’s self-described “guardian angel”. While it’s Scarlett’s strong voice that takes the forefront, the other characters bring the story together. This is one of those rare books in which I actually found the characters more fascinating than the story. It’s not obvious if this will be a series, but I hope Jennifer Latham continues with further adventures. If you’re feeling nostalgic for Veronica Mars and you enjoy a light mystery with a diverse cast of characters, I recommend you try this. I don’t think you’ll be disappointed.